The Associated Press has reported that Zeituni Onyango, a native of Kenya, has been living in Boston despite losing an appeal for asylum four years ago. Obama’s campaign issued a statement earlier Saturday that the Democratic nominee “has no knowledge of her status but obviously believes that any and all appropriate laws should be followed." The campaign also said it would return $265 in donations from Onyango, who is not legally permitted to donate to Obama because she is not a U.S. citizen. CNN has been unable to independently verify the aunt's immigration status. 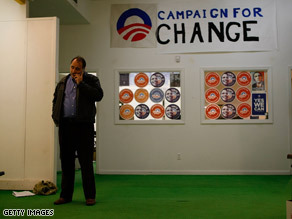 On the campaign trail in Nevada, Axelrod said the timing of the report might raise a few eyebrows. "The campaign issued a statement on that," he said. "And I don't have anything more to add to it, other than I think people are suspicious about stories that surface in the last 72 hours of a national campaign... I think that they're going to take that, they're going to put it in that context." House Judiciary Committee Chairman John Conyers of Michigan questioned both the timing and the source of the news Saturday, sending a public letter to Homeland Security chief Michael Chertoff requesting an investigation. Gov. Palin campaigned in Florida Saturday as the state's governor, Charlie Crist, looked on. NEW PORT RICHEY, Florida (CNN) - With a smiling Gov. Charlie Crist at her side, Republican vice presidential candidate Sarah Palin kicked off a three-city bus tour of central Florida on Saturday by focusing on the financial concerns of the nearly three million Floridians over the age of 65. Palin promised that she and John McCain will “keep our defining commitments to our senior citizens.” But she wasted little time on the Republican agenda and turned her sights, as usual, on Barack Obama, who has accused McCain of wanting to cut Medicare funding and place Social Security benefits in the stock market. Palin added that Obama favors a government takeover of health care, an accusation that drew boos from the audience. According to the Obama campaign, Richardson meant to say that people making under $250,000 won’t see their taxes increase. That analysis was actually conducted by the Heritage Foundation, a conservative think tank, which concluded in a recent report that “total employment” would fall an average of 589,000 a year under Obama's tax plan. According to Heritage, that number represents the number of jobs that would exist over a ten year period, compared to the potential number of jobs that would exist under current tax law. The study itself says that while McCain’s plan would create more jobs, the number of jobs in the country would grow under either candidate. As Palin wound down her remarks, a group in the rear of the audience began a noisy chant of "John McCain! Not Hussein!" - but the governor did not appear to hear or acknowledge them. 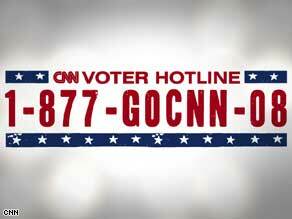 Call CNN's voter hotline with your concerns or problems with voting. (CNN) - With just three days to go before Election Day, calls were streaming into the CNN Voter Hotline. More than 21,500 people have called in to the hotline as of Saturday. More than 7,300 of them registered a complaint regarding voting issues. The largest number of complaints continues to be issues surrounding registration. With the deadline approaching for submitting absentee ballots, many callers are asking what to do if they still haven't received their forms. Concerns about vote counting are the third most logged complaint on the line. Many callers also cited long lines and other difficulties at polling locations for early and absentee voting. Problems with voting machines are the fifth most discussed topic on the Hotline. Florida voters have called the Hotline more than any other state's, with many of the calls coming from Broward, Dade and Palm Beach counties. Georgia voters have also called in high numbers with complaints about the long lines and other voting location problems. CNN will be tracking voter problems through Election Day. If you have a problem or see a problem, call the CNN Voter Hotline at 877-462-6608. See what issues are a concern in each state by clicking on the interactive Hotline map at cnn.com/hotline. (CNN) – Sen. Barack Obama has lost a single point of his lead over Sen. John McCain in CNN’s latest national poll of polls. Obama is ahead of McCain by six points in Saturday’s poll of polls. Fifty percent of likely voters nationally support Obama, 44 percent support McCain, and six percent are unsure about their choice for president. In CNN’s October 31 national poll of polls, Obama had a seven-point lead over McCain – 50 percent compared to 43 percent. CNN’s latest national general election poll of polls consists of the following six surveys: Fox/Opinion Dynamics (October 28-29), ABC/Washington Post (October 28-31), Reuters/C-SPAN/Zogby (October 29-31), Gallup (October 29-31), Diageo/Hotline (October 29-31), and IBD/TIPP (October 27-31). CNN’s national poll of polls does not have a sampling error. Fact check: Does Obama think nuclear power is unsafe? 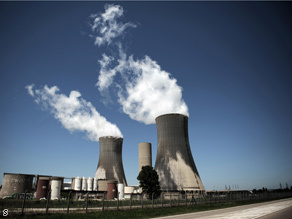 McCain has pushed for more nuclear power – and claimed Obama is completely opposed to it. The Statement: Sen. John McCain, speaking at a rally in Newport News, Virginia, on November 1, touted his energy plan and said, "We'll invest in all energy alternatives, wind, solar, tide and safe nuclear power." Then he said, "You know, Senator Obama doesn't think that nuclear power is safe." (CNN) – A CNN poll of polls released Saturday suggest the presidential race may be tightening in Pennsylvania — a state John McCain’s campaign has made a top target in the campaign’s closing days. Sen. Barack Obama’s lead over Sen. John McCain in Pennsylvania stands at eight points, according to CNN’s latest poll of polls in the state. Fifty-one percent of likely voters in the state back Obama while 43 percent back McCain. Six percent are undecided. CNN’s previous Pennsylvania poll of polls, released October 30, showed Obama leading McCain by 11 percentage points – Obama had 53 percent support and McCain had 42 percent. The race in Indiana is tied in CNN’s latest poll of polls in the historically Republican state. Both nominees have the support of 47 percent of likely voters in Indiana, with 6 percent are unsure about their choice for president. In CNN’s previous Indiana poll of polls, released October 30, McCain had a one-point advantage over Obama – 47 percent to 46 percent. In Florida, Obama is ahead of McCain by four points. The Illinois senator garners support from 49 percent of likely voters in the state and 45 percent support the Arizona senator. Six percent of likely Florida voters are unsure about who should be the next president. In CNN’s October 31 Florida poll of polls, Obama was ahead of McCain by 3 points – 48 percent for Obama and 45 percent for McCain. 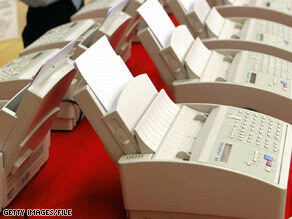 A caller to CNN's voter hotline will be allowed to vote by secure fax. (CNN) – When Chawnte Williams, a voter registered in the Denver area, originally called CNN’s voter hotline, the prospects of actually casting an absentee ballot did not look good. “I applied for an absentee ballot before October 6,” Williams explained in her call. When the ballot did not arrive earlier this week as promised by local election officials in Denver, Williams called to check in “and they had no record” of Williams' request for an absentee ballot. “So, because of somebody’s clerical error, now it looks like I might not be able to vote,” Williams also said on her hotline call. "I feel like I'm not going to be able to vote and there's no reason why," Williams also told CNN in a telephone interview Thursday. After making contact with election officials in Denver again on Friday, Williams learned she will be able to vote absentee after all. “I was informed that I will be able to fill out a write-in ballot and send it to the commission by a secure fax machine,” Williams wrote in an e-mail to CNN Saturday. “Thanks for all of your help,” she added. CNN estimates that roughly 23 million Americans have already cast ballots in this year’s general election. McCain trails Obama in Virginia. (CNN) - A month ago, John McCain’s brother Joe called the Northern Virginia “communist country.” Two weeks ago, a key surrogate said the area wasn’t even a “real” part of the state. 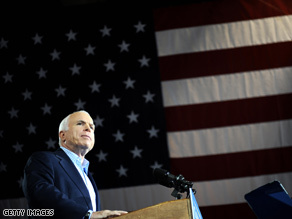 On Saturday, John McCain told voters there the area was “key” to a Republican victory. "I want to remind you again, Fairfax County is key to this election," McCain told a Springfield, Virginia crowd. "You know that. You know how important it is for us to win here, you know how important it is that we put this country in the right direction. I need your help for the next three days." 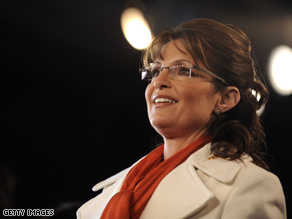 Palin fell victim to Canadian pranksters Saturday. (CNN) - Republican vice presidential nominee Sarah Palin fell victim Saturday to Canadian pranksters who convinced her she was actually speaking by phone with French President Nicolas Sarkozy. Palin spoke to Marc-Antoine Audette for about six minutes before the comedian identified himself, and she ended the call. “Thank you sir, we have such great respect for you, John McCain and I, we love you,” Palin tells the imposter, who tells her he hoped she will be president one day. "Ha ha, maybe in eight years," she responded. Audette, as Sarkozy told Palin that hunting was one of his favorite activities. "Oh, very good, we should go hunting together," Palin replied, adding, "I think we could have a lot of fun together as we're getting work done. We could kill two birds with one stone that way." "I just love killing those animals! Taking away life, that is so fun," said the fake French president. Still waiting on your absentee ballot? CNN's voter hotline has received call from voters who are still waiting to receive their absentee ballots. (CNN) – With Election Day approaching fast, many voters have called into CNN’s voter hotline to report that they are still awaiting absentee ballots. CNN got in touch with some of the counties where those calls originated, and has some guidance for voters in those areas. The deadline for returning absentee ballots in Philadelphia County, Pennsylvania has passed, according to information available on the Philadelphia County Board of Elections Web site. Bill Rubin, the Supervisor of Elections for Philadelphia County in Pennsylvania, told CNN the best thing for voters registered in the county to do at this point is to go to the polls in person and vote on Election Day. Voters waiting on absentee ballots from Palm Beach County, Florida should call Bob Bartelsmeyer, the county’s absentee ballot coordinator, at 561-656-6234. Click here for more about voting by absentee ballots in Palm Beach County. If you are still waiting on an absentee ballot and you are registered in the City of Chicago, Jim Allen, spokesman for the Chicago Board of Election Commissioners, recommends calling the city’s absentee ballot department at 312-269-7967. For more information on absentee voting in the City of Chicago, click here. If you are registered in suburban Cook County in Illinois and have not received an absentee ballot, Courtney Greve, spokeswoman for the Cook County Clerk, advises calling the clerk’s absentee ballot line at 312-603-0944. For more information about voting absentee if you’re registered in suburban Cook County, click here. Dean Logan, the Los Angeles County Registrar of Voters, recommends that voters still waiting on absentee ballots check the status of their ballot request on search engine available at www.lavote.net. Logan also told CNN that early voting is available at the L.A. County Registrar’s Headquarters in Norwalk, California through Monday evening. Click here to read an October 28 press release about early voting in L.A. County. Absentee ballots that have already been received may be returned in person to the headquarters by the time polls close on Election Day or to any polling place on Election Day as well. Click here to read an October 31 press release/update about early voting and voting by mail in L.A. County. For information on early voting in other jurisdictions, click here for a list of links.